A HayGrazer Horse Hay Slow Feeder Bag. The HayGrazer is made from hard wearing material and designed for outdoor or indoor use to minimise hay wastage and to promote healthy eating with less hay wastage. Available in Navy or Pink. Ideal for Slow Feeding - The top completely shuts so horses cannot get the hay out of the top. No more filling hay nets, as the bag holds about 7kg of hay. Easy to fill, hang and carry now with removable poles so machine washable and two clips with removable straps for easier hanging in lorries. Small holes for slow feed and the top completely shuts. The HayGrazer material is better than ever with is double sided anti rip coating. It is now easily washed down, doesnt smell like other material even when used for soaking hay and withstands being hung up next to rough or uneven surfaces. This material is the same material often used for bouncy castles and marquees being very tough and easily cleaned. The Horse HayGrazer Slow Feeder Forage Bag is a new innovative way to feed your horse. Suitable for use in the field, stable, trailer or lorry. 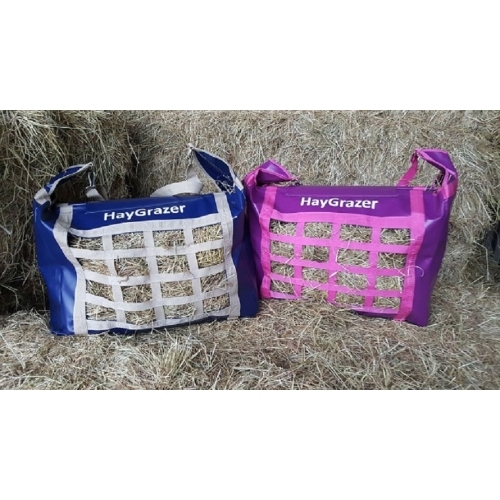 The HayGrazer Bag intends to keep your horse occupied which prevents boredom, chewing, cribbing etc.